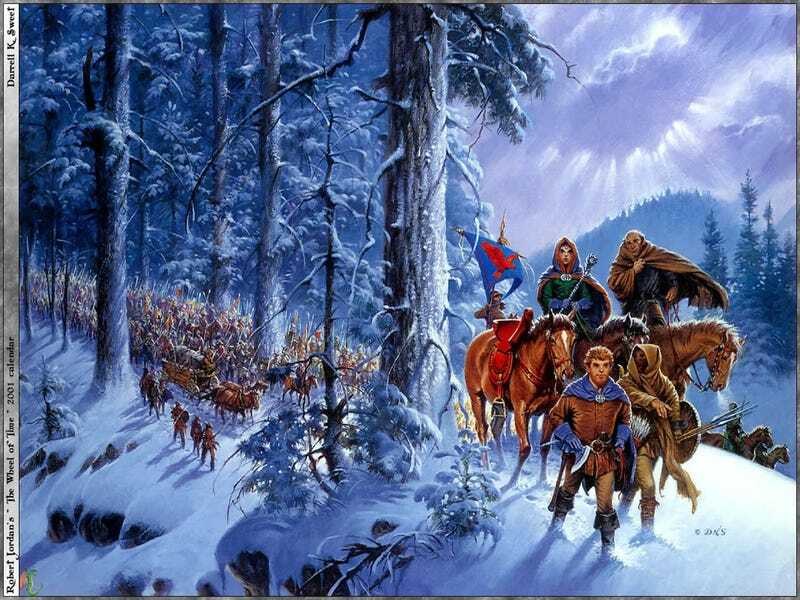 The Wheel of Time by Robert Jordan is one of the most popular book series of all time. So you'd think the first episode of a TV version would air with massive fanfare... so why did the pilot air in the middle of the night instead? We reached out to the producers and found out why. Now updated with more info! In a nutshell, Winter Dragon, which aired early this morning on FXX, was not actually FXX programming. It was "client-supplied programming," according to an FXX spokesperson — which I believe means that someone rented time on FXX to show it. Similar to a late-night infomercial. So what gives? We spoke to Rick Selvage, CEO of Red Eagle Entertainment and the executive producer of Winter Dragon, who told us "it was more of an [issue of] getting it on the air." Selvage had to be very careful about what he told us, but reading between the lines, it sounded as though his company has the rights to make a Wheel of Time TV series — but those rights were about to expire, unless they got something on television by a certain date. "You probably know that a lot of pilots are put on the air at different times in different ways, and for different reasons," Selvage tells io9. As with "a lot of other properties, there's always an airdate that you need to air something by... and that was certainly part of it." But the fact that this pilot aired in the middle of the night as paid programming does not mean there aren't lavish plans for a Wheel of Time series, says Selvage, who promises more announcements soon. Winter Dragon was "a pilot for a high-budget production television series," says Selvage. "We think there's huge demand for the television series internationally, and we're looking forward to producing it and getting it out in the marketplace." "Obviously, the pilot was a prologue to the eye of the world, which is the first book," adds Selvage. "It was not the introduction to the series, although it is a pilot." He's gratified by the discussions he's seeing on the internet about the pilot. "Certainly, we want fans to find out about it and be excited that there's a lot more to come." So if the show does become an ongoing series, will they need to recast? Selvage says that since Lews Therin doesn't really appear outside of the prologue, no recasting might be necessary. The prologue is "really just a dialogue between good and evil, and you have to do the prologue and the age of legends in the series." The characters of Lews and Ishmael "don't necessarily show up other than flashbacks in the series." "We don't have to worry too much about the continuity between [the prologue] and the main story," because the actual story "starts out with young males and females at the beginning." So they don't need to worry too much about recasting those two characters. As for the mention of "film" just now, Selvage says they had considered trying to do a Wheel of Time movie, but it was just too rich to try and fit the story into two hours. "We felt the story for the Eye of the World was very complicated. You need character development, you have to build the world... And since Game of Thrones came out and did well on television," with "high production values," that showed that Wheel of Time could work on television as well. "That doesn't mean we won't do film at some point in the future," adds Selvage. "But at the moment, this project is destined to be a television series." And Wheel of Time has one advantage over Game of Thrones: "With all the content, over 13,000 pages, this could go a very long time. Game of Thrones has already run out of material, and we don't have that problem." I see no mention of Universal in the "pilot". Nor, I repeat, was Bandersnatch, or Robert Jordan's estate, informed of this in any way. I've verified the authenticity of that statement with folks from Tor, her publisher. Update #2: Adam Whitehead with The Wertzone has a rundown of the history of Red Eagle Entertainment and the Wheel of Time series.